Posted by Dave Emory ⋅ September 4, 2018Post a comment Email This Post Print This Post Tweet This! Introduction: In this program we continue and expand analysis of the EuroMaidan sniper killings which led to the ouster of the Yanuukovych government. A story from BNE Intellinews, since taken down but available via the Way Back Machine, details Paul Manafort’s networking with the Hapsburg Group milieu, providing more details that supplement previous discussion of the relationship. Manafort’s close relationship with Serhiy Lovochkin, a key aide to Viktor Yanukovich and owner of a premier Ukrainian TV station, and his sister Yulia Lovochkina, who owns an airline whose planes ferried Manafort in his dealings with the Hapsburg group. The important role of Serhiy Lovochkin and his sister in promoting the EU Association Agreement. It was Yanukovich’s eventual rejection of that agreement that led to the demonstrations that led up to the Maidan coup. 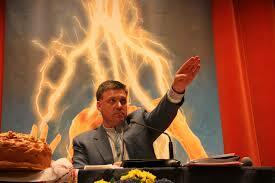 The dual role played by Hapsburg Group member Alexander Krasniewski, who was ran the EU’s Ukraine Observation Group. The profound degree of involvement of Manafort with the Hapsburg Group. Of paramount significance for our purposes, is the behavior of Manafort, Lovochkin, Lovochkina, Dmytro Firtash and Victoria Nuland. Nuland and Svoboda’s Tihanybok, left, and “Yats” Arsenyuk on the right. The private jet flights and personal connections show that Manafort’s partner in this lobbying effort was Yanukovych’s chief of staff Lovochkin. Lovochkin said that he had also “always been a strong supporter of the European integration of Ukraine,” but denied that he had supervised Manafort’s lobbying. Kwasniewski confirmed that Lovochkin was in the pro-EU camp. Lovochkin is the junior partner of billionaire oligarch Dmytro Firtash who made his fortune trading gas via notorious company Rosukrenergo, who had made his fortune trading gas via notorious company Rosukrenergo, that allegedly skimmed off hundreds of millions of dollars for the Russian and Ukrainian elite. Lovochkin and Firtash together also control Ukraine’s largest TV channel, Inter. Manafort’s continued participation in post-Yanukovych Ukraine also points to his ties to Lovochkin and Firtash. While most members of the Yanukovych administration fled to Russia or were arrested after February 2014, Lovochkin has continued his political career with impunity, despite having served at the heart of Yanukovych’s regime for four years. Post Yanukovych’s ousting, Manafort may have attended top-level Ukrainian political meetings where the oligarchs decided who would govern. On March 25 he flew out of Vienna to Kyiv. His visit to Vienna had coincided with a crucial meeting between Petro Poroshenko and Vienna-based Firtash in that city. Lovochkin had also attended the meeting at which Firtash agreed to back Poroshenko for the post of president, rather than former boxer Vitaly Klichko, effectively crowning Poroshenko president. In November 13, 2014, as details of a new government were being hammered out after the parliamentary elections, the flight data records that Manafort flew from Kyiv to Nice, France, on a private jet with Ihor Tarasiuk, the business partner of Poroshenko’s first deputy chief of staff, Yuri Kosiuk. Tarasiuk denied taking the flight to bne IntelliNews, although he confirmed the personal data provided was correct. Manafort’s Ukraine engagements actually increased following Yanukovych’s ouster in February 2014. In March to June 2014, he spent a total of 27 days in Ukraine, whereas during the four preceding Euromaidan months, November-February 2014, Manafort only visited Ukraine three times for a total of nine days. According to the Mueller indictment, Manafort was engaged as lobbyist for Lovochkin’s new party Opposition Bloc, widely regarded as funded by Firtash. This explains Manafort’s long stays in Ukraine during the post-Maidan election campaigns, according to the flight data: one week prior to the presidential elections in May 2014, and one month prior to the parliamentary elections in October 2014. Manafort’s flight data concludes with a four-week stay in Ukraine through to October 27, 2015. This period coincides with the campaign for regional elections, which cemented Lovochkin’s Opposition Bloc as a dominant force across south and east Ukraine. Only months after the close of electioneering in conflict-wracked Ukraine, Manafort was electioneering in the US, on behalf of the controversial candidate for the world’s most powerful office. Manafort’s flight data sheds no light however on his relationship, if any, to the Euromaidan revolution. Euromaidan was triggered by events in Kyiv on the night of November 29, when police violently dispersed a small demonstration of pro-EU students who were protesting after Yanukovych refused to sign the Association Agreement. The violence prompted a huge demonstration occupying the heart of Kyiv on December 1. All we have are cryptic messages exchanged between Manafort’s daughters, one of whose phones was hacked in 2016. Manafort confirmed the hack and corroborated some of the messages to Politico. The remarks were made by those privy to the deepest secrets of Manafort’s personal life. They evoke the suspicion that Manafort manipulated the Maidan protests and the police violence to influence international opinion. The appearance of the Manafort messages in 2016 reignited speculation in Ukraine that none other than Lovochkin instigated the attack on the students’ demonstration on November 29, 2013, to trigger outrage against Yanukovych. Some of the timeline fits this interpretation: On the day before the police attack, reporters noted Yulia Lovochkina openly fraternising with the students on the Maidan. Lovochkin’s TV crews covered the 4am events closely, and Lovochkin immediately tendered his resignation in protest at the police violence. The next day, Lovochkin’s TV channel played footage of the worst of the police violence on heavy rotation on prime time news. News anchors intoned that Yanukovych had “shed the blood of Ukrainian children.” Whereas the student protests had attracted hundreds, protests on Sunday December 1 against the police violence attracted hundreds of thousands. This was the start of Euromaidan. Authoritative chronicler of the Euromaidan revolution Sonya Koshkina, as well as Ukrainian prosecutors, have argued it was anti-EU hardliners who were responsible for attacking the students. Lovochkin denies any role in the attack on the students. “I submitted my resignation because of President Yanukovych’s decision to decline signing the Deep and Comprehensive Free Trade Area (DCFTA) […] and the use of force against peaceful protesters in Kyiv following it,” he said. What was Lovochkin’s motivation to break with Yanukovych so abruptly over Europe, whether or not he was involved in the violence? According to Koshkina, Lovochkin was “a placeman of Firtash and one of the architects of the regime,” hardly a nationalist or freedom-loving liberal. But in June 2013 the US had indicted Firtash for alleged bribery in India. On October 30 2013 — as Yanukovych was wavering over the Association Agreement with the EU — the US issued an arrest warrant for Firtash. The US withdrew the arrest warrant four days later — after US deputy secretary of state Victoria Nuland met Yanukovych in Kyiv, and received assurances that Yanukovych would sign the Association Agreement, Firtash said during extradition hearings in Vienna in 2015 that first revealed the details of the case. But come the Vilnius Summit, Yanukovych failed to sign. The arrest warrant was reissued in March 2014, and Firtash was arrested in Vienna on March 12, 2014. . . . .
2. 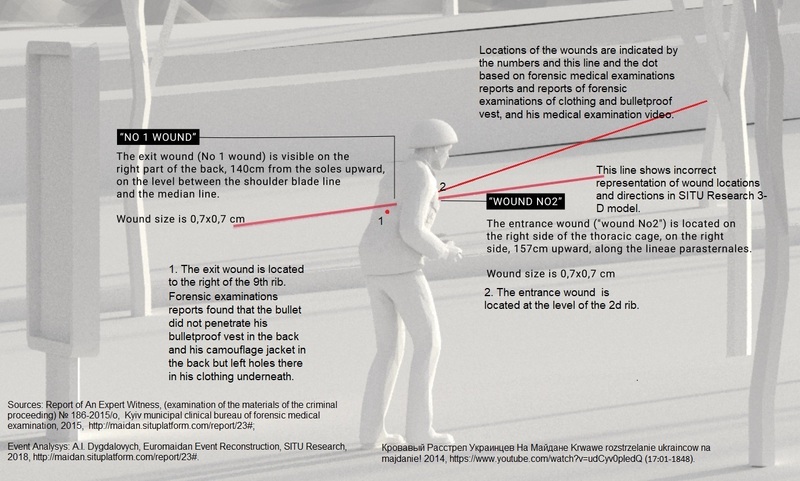 Canadian academic Ivan Katchanovski has done a deep, detailed forensic study of the evidence in the Maidan sniper attacks. He has a rigorous, succinct digital multimedia ‘poster’ (an ‘iPoster’) for his finding that the Maidan sniper attacks were a false flag operation. That poster was presented during the 2018 American Political Science Association conference in Boston. 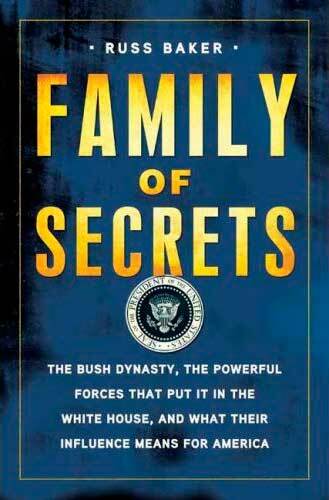 It gives a high level overview of his research and is heavily embedded with substantive, documentary videos. Here are the contents of the poster. Be sure to check out the numerous images and videos included in the actual iPoster online. In addition to the systematic manipulation of evidence to support the “Berkut/Yanukovych did it” hypothesis, the cover-up of contrary findings and the Western media silence about the realities of the Maidan killings are significant. Discussion of this presentation will be continued and expanded upon in our next program. * Many scholars uncritically cited Maidan politicians, government officials, and the media concerning this massacre without examining evidence, including from trial and investigations, for example, misattributing the massacre to government snipers (See, for example, Marples and Mills, 2015; Wilson, 2014). * What does evidence made public by the Maidan massacre trials and Ukrainian government investigations reveal about which of the parties of the conflict was involved in this mass killing? Such testimonies are consistent with some 200 witness testimonies in media and social media about snipers in Maidan areas, including over 70 video testimonies. * Kyiv court decisions revealed that the Prosecutor General Office of Ukraine investigated leaders and members of the far right Right Sector, neo-Nazi “Warriors of Narnia,” Sokil, a youth affiliate of far right Svoboda party, far right Bratstvo and other unidentified Maidan activists for their suspected involvement in the killing and wounding of the Interior Troops servicemen and the Berkut police on February 18-20 (see, for example, Ukhvala, 2016a). * Yanukovych and his commander of Internal Troops testified at the trial as witnesses via video link from Russia the same and that they did not give orders to massacre protesters. Investigation by the Military Prosecutor Office in Lviv found that the Maidan protesters in Khmelnytskyi were killed and wounded by unidentified Maidan shooter from the Security Service of Ukraine regional headquarters porch that was occupied by Maidan protesters. This is consistent with the content analysis of videos of this massacre (see Video Appendix C). Similarly, 48 out of 51 wounded protesters, whose wound directions were revealed at the trial and with whose shooting on February 20th Berkut policemen were charged, had wounds at significant slopes. * Common sense and forensic textbooks suggest that this is consistent with shooting by snipers in/on buildings. Sideways and back locations and directions of their wounds in the absolute majority of cases also point to shooting from Maidan-controlled buildings located on both sides and in the back of advancing protesters and not from their front by the Berkut police (see Map). * Three other protesters were killed by pellets used in hunting. * Two protesters were killed by expanding hunting bullets. Their caliber did not match calibers of weapons used by the special Berkut company, whose members were charged with killing them. * But their killing and wounding in the same locations and at the same time as other protesters suggest that most of them were also likely shot by the Maidan snipers. Court rulings revealed that the weapons used by two wounded Right Sector activists in a separatist checkpoint attack in April 2014 were the same weapons from which two Internal Troops servicemen were killed and three other policemen wounded on the Maidan on February 18 (Ukhvala, 2016b). * Investigation denies that there were snipers in Maidan-controlled buildings & not investigates them in spite of overwhelming evidence revealed by investigation & trial & publicly available evidence, such as testimonies by over 100 wounded protesters & over 200 witnesses, & videos, photos & audio of snipers in/on these buildings, including their shooting at protesters & police (Video Appendix A). 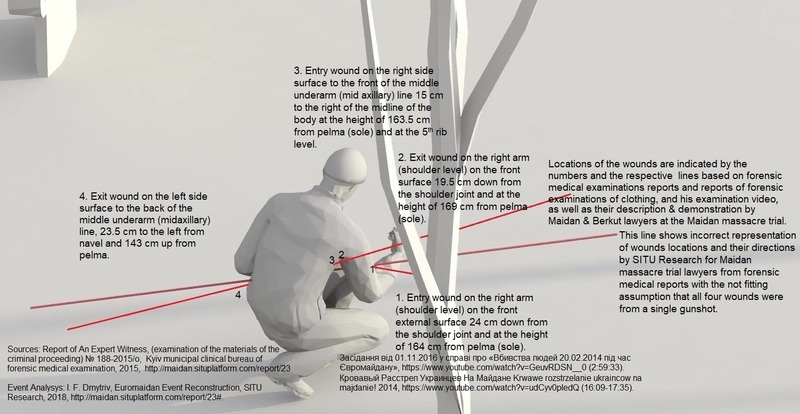 * Both these complex medical examinations and the 3-D model by New York architecture company provided practically identical bullet trajectories/sectors of fire from Berkut barricades on the ground in cases of these 3 killed protesters. (See images concerning Dmyriv above and Dyhdalovych below, Report (2015a, 2015b); SITU (2018)). Bullet wounds locations and their steep slopes along with bullet holes appearing in shields right after their killings in the same spot within 2 minutes and a testimony of a protester who was in the same spot that he saw Dyhdalovych shot by a sniper on the Bank Arkada point to the top of this building as a location of snipers who killed both Dyhdalovych and Dmytriv. (See Map, Video Appendix A). The landscape, the street, & trees on the site of the massacre would be almost completely changed into a park and a new Maidan massacre museum by February 2019 and it would be physically impossible to conduct on-site investigative experiments to determine bullet trajectories. A new ballistic expert examinations of bullets that was ordered by the Maidan massacre trial has not started for more than 1 year after the court decision. No forensic video and audio examinations were conducted by the investigation. The Prosecutor General Office reversed without any explanations their own previous investigation findings. The Prosecutor General Office has been headed by Maidan politicians or close allies of the current president of Ukraine and the investigation of the massacre has been under control of Maidan government leaders from the start. Two factions of main ruling Maidan parties blocked creation of a parliamentary commission concerning Maidan massacre investigation. Key pieces of forensic evidence of the massacre on February 20 disappeared when it was under the Maidan opposition or Maidan government control or when it was in the possession of the Maidan government investigation without anyone responsible identified and prosecuted. No one was charged with killing and wounding the majority of Maidan protesters on February 18-19. Nobody is charged with killing of a Georgian protester on February 20 and circumstances of his killing and its investigation are not made public. Nobody is charged and tried for killing and wounding policemen on February 18-20. Several attacks by the neo-Nazi C14 and other far right groups disrupted and threatened the trial. * C14 took refuge in the Canadian Embassy shortly before the Maidan massacre, and one of its ex-leaders stated that the C14 knew about the massacre in advance. No such evidence of systematic cover-up by the Yanukovych government leaders and Berkut members. * Yanukovych treason trial revealed various evidence that he fled Ukraine following several assassination attempts by Maidan forces, including far right. * He, his ministers and Internal Troops ex-commander volunteered to testify via video links about the massacre at the trials. * Absolute majority of Berkut members, who were charged with the massacre did not flee Ukraine until they were to be charged with the massacre or after they were charged. Not a single person is convicted for killing and wounding some 100 protesters and the police on February 18-20, 2014. Maidan massacre trial and investigation evidence have revealed various evidence that at least the absolute majority of 49 killed and 157 wounded Maidan protesters on February 20, 2014 were massacred by snipers in Maidan-controlled buildings. * Such evidence includes testimonies of the majority of wounded protesters and many witnesses, forensic medical and ballisitic examinations, and investigation own finding that about half of Maidan protesters were wounded from other locations than the Berkut police. Various indications of stonewalling of the Maidan massacre investigations and the trials by the Maidan government officials and by far right organizations. Various indications of the cover-up of much of the key evidence of the massacre. Such revelations from the Maidan massacre trials and investigations corroborate previous studies findings that this massacre was a false flag mass killing with involvement of elements of Maidan leadership and the far right and that it included the massacre of the police. The puzzling misrepresentation of the Maidan massacre, its investigation, and the trial by Western media and governments require further research concerning reasons for such misrepresentation. 3. Against the background of the Maidan sniping as a probable false flag provocation, the impending Syrian offensive to re-capture the last territorial enclave of the Islamists in Syria should be viewed with apprehension. As noted in the article below, the so-called “rebels” are Al-Qaeda offshoots. Ominously, they have apparently successfully executed false-flag chemical weapons attacks before, including in Idlib province. “Rebels;” German Foreign Policy; 9/03/2018. Berlin and the EU are intensifying pressure on Damascus in view of the Syrian troops’ presumed imminent offensive in Idlib against the jihadi militias, including al-Qaeda’s Syrian offshoot. According to a German government spokesperson, it is “anticipated” that the Russian government will “restrain the Syrian regime’s escalation.” Washington is threatening with an unspecified intervention, should chemicals weapons be used. Syrian jihadists have used chemical weapons in the past, and would be in a position to provoke this US intervention. Since last summer, the Syrian al-Qaeda offshoot Hayat Tahrir al-Sham is in control of Idlib Province, with some 30,000 combatants. Additional smaller, mostly salafist jihadi militias are also ready to battle the Syrian army. By referring to them as “rebels,” politicians and media are downplaying the jihadists – including al-Qaeda – as the 17th Anniversary of the 9/11 attacks approaches. Slightly more than a year later, it is unclear whether this assessment still holds true. The situation in Idlib has not fundamentally changed, in spite of some shifts in power while the Syrian government is preparing to recapture the province, with Russian support. The al-Qaeda offshoot Hayat Tahrir al-Sham suffered minor setbacks for two reasons. On the one hand, small fractions have split off because of internal dissention. After invading parts of Idlib, Ankara, on the other hand, has begun to strengthen militias, which had been marginalized by Hayat Tahrir al-Sham and merge them into a new alliance. Its members are, to a large part – such as Ahrar al-Sham or Jaysh al Ahrar – salafist jihadi oriented like the Hayat Tahrir al-Sham’s split-offs. Militias who are oriented otherwise – such as those close to the Muslim Brothers – are in the minority. Experts report that the al-Qaeda offshoot now controls nearly 60 percent of Idlib province and consists of about 30,000 fighters, according to the London based Syrian Observatory for Human Rights , which western media and government agencies often quote as their source of information on Syria. Thus, al-Qaeda has about one percent of Idlib’s current population under arms – shortly before the 17th anniversary of the attacks on September 11, 2001. And yet, currently western politicians and media are against Syria and Russia much more than al-Qaeda. Thus, al-Qaeda-predominated jihadi militias in Idlib are regularly euphemized as “rebels,” and the province, itself, as a “rebel stronghold.” If one goes along with this terminology – which comes quite close to the way the jihadis see themselves – then al-Qaeda leader Ayman al Zawahiri and his predecessor Osama bin Laden must be “rebel leaders,” and the terrorists of Paris and St. Petersburg would have been acting in the name of a “rebel organization.” Otherwise, this pattern of argumentation resembles that during the combat waged by the Syrian army against Salafist and jihadis for East Alleppo, for East Ghouta and more recently for Daraa. Warnings of massacres at the hands of Syrian troops and the supporting Russian military are already being propagated in advance. According to a German government spokesperson, who expressed that the government is “very worried about the escalation of the situation in northwest Syria” and “anticipates” that Moscow “will restrain the Syrian government from an escalation thereby averting a humanitarian catastrophe.” “We must prevent military engagements in Idlib that could lead to a humanitarian catastrophe,” announced Federica Mogherini, EU High Representative for Foreign Affairs and Security. Further escalation of this argumentation is easily possible. For example, in German media, it was claimed during the battle over East Aleppo that the Syrian military was committing “genocide” in the city. What was happening there was “worse than Auschwitz.” (german-foreign-policy.com reported.) On the other hand, German politicians and media, have had no criticism of the bloody battles waged for Falluja, Mossul, and Raqqa, which had been carried out by western military forces. Aside from regrets at the loss of civilian lives, these battles are still today being celebrated as heroic victories over jihadis. But in fact, the battles waged by the West have differed little from those waged by Syria and Russia, in terms of the number of deaths and the extent of destruction. (german-foreign-policy.com reported.) A team of the UN High Commission for Refugees (UNHCR) even declared in the spring, that the extent of destruction in Raqqa had “exceeded anything” they had “ever seen before.” Raqqa had not been devastated by Syrians and Russians in the course of the war against the IS but rather by western air strikes using reconnaissance data provided by the Bundeswehr in collaboration with pro-western troops on the ground. Whether this will simply remain a case of negative coverage of the upcoming battle for Idlib or whether individual western powers will intervene, remains uncertain. A few days ago, the USA, Great Britain and France published a statement, wherein they expressed their “serious concern over reports,” according to which, “the Syrian regime is preparing a military offensive against civilians and the civilian infrastructure in Idlib.” They are also “worried” that the Syrian military forces will probably use chemical weapons. If this happens, the three countries are “determined to take action.” Subsequently, US President Donald Trump’s National Security Advisor, John Bolton affirmed that the USA would react “very strongly” should there be a chemical weapons attack. In fact, the western powers are giving jihadi militias in Idlib an option: should they not be able to vanquish the Syrian military, they can feign a chemical weapons attack and the West will intervene on their side. That Syrian jihadis have already used chemical weapons and, therefore, know how to do it, is well known. A western attack against Syrian forces in or around Idlib would, in the current situation, help the Syrian offshoot of al-Qaeda. Aron Lund: New order on the border: Can foreign aid get past Syria’s jihadis? irinnews.org 15.08.2018. Bruce Hoffman: Al Qaeda’s Resurrection. cfr.org 06.03.2018. Hayat Tahrir al-Sham: Syria Regime’s Toughest Foe in Idlib. military.com 01.09.2018. EU warnt vor Katastrophe in Idlib. handelsblatt.com 31.08.2018. See also Die Schlacht um Mossul (IV). See also Double Standards and Die präzisen Luftangriffe des Westens. Zitiert nach: Amnesty International: “War of Annihilation”. Devastating Toll on Civilians, Raqqa – Syria. London 2018. US, UK, France statement on the chemical weapons attack in Syria. reliefweb.int 21.08.2018. Sommer Brokaw: Bolton: U.S. will act ‘strongly’ if Syria uses chemical weapons again. upi.com 22.08.2018. Specifically, Patten told Arveladze over Facebook, “Call of [sic] your trolls now or I’ll start releasing things about Misha he’d prefer I didn’t.” After not hearing back, Patten sent another message a few hours later. “Misha knows what I’m talking about but frankly I have bigger problems these days, maybe you two are no longer as tight as you used to be.” Keep in mind that these messages were sent over Facebook messenger so it’s not like all of Arveladze’s friends could see it. In other words, they were intended to be private messages/threats. But the threats didn’t stay private for long. Saakashvili just happened to contact Arveladze a few minutes after the second message was sent, which also happened to be right before Saakashvili was about go go live on CNN. And Saakashvili apparently called Arveladze specifically to refresh his memory about Patten. According to Arveladze, “Misha called me and said, ‘In five minutes I have an interview on CNN, remind me of some things about this guy.’” Saakashvili then went on CNN and read Patten’s threats live on the air. Arveladze also claims that he had no idea why Patten sent out these messages and what exactly Patten was referring to regarding the thing that he said Saakashvili “knows what I’m talking about.” Saakashvili suggested that it may have been prompted by a Facebook post Saakashvili made earlier in the day commenting on Patten’s guilty plea, which would have drawn the attention of Saakashvili’s followers and may have resulted in a wave of trolls targeting Patten. Just two days after pleading guilty to failing to register as a foreign agent and acting as a straw purchaser of presidential inauguration tickets for a Ukrainian oligarch, American lobbyist Sam Patten sent a pair of angry Facebook messages to Georgia’s former economy minister on Facebook messenger. “Call of [sic] your trolls now or I’ll start releasing things about Misha he’d prefer I didn’t,” Patten wrote to George Arveladze, the Georgian former minister and parliamentarian, who had also served as chief of staff to then-Georgian President Mikheil “Misha” Saakashvili. More than three hours later, having not heard back from Arveladze, Patten wrote to him again. It was a surprising move from the lobbyist, whose undeclared work for a pro-Russian oligarch in Ukraine earned him the scrutiny of special counsel Robert Mueller’s team. Mueller eventually handed Patten’s case off to the U.S. Attorney’s Office in Washington, D.C., but as part of his plea deal, Patten pledged his cooperation on Mueller’s probe. Patten and former Trump campaign chairman Paul Manafort share a number of associates — including Konstantin Kilimnik, who, like Manafort, is charged with witness tampering — and Patten could be a valuable witness for the Mueller team. But Patten also worked as a political operative in Georgia. After working briefly with Saakashvili’s party in 2008, he worked on the parliamentary campaign of Saakashvili’s rivals in 2012. In that election, Patten’s clients succeeded in winning a parliamentary majority, transferring power from Saakashvili’s United National Movement to the Georgian Dream alliance, backed by the billionaire Bidzina Ivanishvili. Arveladze, the former economy minister and adviser to Saakashvili, told TPM he had no idea what Patten was threatening to release about his former boss, and it is unclear why Patten reached out to Arveladze on Sunday. One possibility suggested by allies of Saakashvili is that, earlier that day, Saakashvili had published a Facebook post commenting on Patten’s guilty plea, drawing the collective attention of the million-plus people who follow the former president’s account to Patten’s case — and undoubtedly drawing out some trolls unhappy with Patten’s past political work in Georgia. Arveladze told TPM over the phone Wednesday that he and Saakashvili were in contact just a few minutes after Patten’s second Facebook message on Sunday. Saakashvili was preparing for a CNN interview, Arveladze said, and wanted to refresh his memory on Patten, who had pleaded guilty on Friday. “Misha called me and said, ‘In five minutes I have an interview on CNN, remind me of some things about this guy,’” Arveladze told TPM. Last weekend, Saakashvili was in the United States following the death of Sen. John McCain, who received quite a bit of attention for his support of Georgia during its 2008 war with Russia. “Today, we are all Georgians,” McCain famously said during his presidential campaign that year. TPM heard about Patten’s messages to Arveladze from Christina Pushaw, who identified herself in an email as Saakashvili’s representative in the U.S. In a phone interview, she said she’d forwarded Patten’s messages to the FBI and Department of Justice, and later provided screenshots of her call logs to TPM. Patten’s Sunday messages to Arveladze were first noted by the law professor Jonathan Turley, who followed Saakashvili as a guest on CNN that day and was taken aback by the messages he read on-air. In a subsequent post on his blog, Turley published the same screenshots that Pushaw would later supply TPM, and argued the messages, if legitimate, could spell trouble for Patten. Turley noted the parallels to Paul Manafort, who’s now facing additional charges for alleged witness tampering, and said Patten’s messages to Saakashvili’s former chief of staff could be interpreted as potential witness tampering themselves. And that raises the question as to whether or not Saakashvili was actually concerned about what Patten threatened to release. While it’s possible Patten was issuing a weak threat and doesn’t actually have much dirt on Saakashvili to dish out, that would just make the whole thing even more remarkably stupid on Patten’s part. It’s also possible that Saakashvili is worried about Patten’s threat and determined that going public is the best strategy. We’ll see. It’s not like we shouldn’t expect someone like Saakashvili to have a closet full of political skeletons so it wouldn’t be at all surprising if Patten’s threat was real. We also shouldn’t necessarily assume that the dirt Patten claimed to have on Saakashvili was necessarily related to his time in Georgia. Both Patten and Saakashvili were operating in Ukraine in in the post-Maidan period, after all, and it’s entirely possible Patten learned about a bunch of dirty stuff Saakashvili was engaging in while he was governor Odessa or something like that. We also shouldn’t necessarily assume that the dirt involves the post-Maidan period. Because one of the potentially most scandalous things Patten may have been referring to could have had to do with the alleged involvement of Georgian snipers during the Maidan sniper attacks. As we saw with Ivan Katchanovski’s academic forensic examination of evidence collected on those attacks, there is are indication that gunmen from outside of Ukraine, including Georgians, were part of some sort of sniper team. And Saakashvili was very much an active booster of the Maidan protests when they were happening. For instance, here’s a Politico article from February 23, 2014 (days after the sniper attacks) authored by Saakashvili giving advice on how to keep the protests going. Given the circumstantial evidence suggesting Paul Manafort and Sergii Lovochkin may have been involved in orchestrating that attack, and Patten’s closeness to both of them, it wouldn’t be too surprising if Patten has insider knowledge of what took place during those events. Might that have been at the core of Patten’s threats against Saakashvili? Perhaps, although it would be one helluva move of Patten’s part since leaking that kind of information would simultaneously put people like Manafort and Lovochkin in big trouble. Then against, given that Patten is already a cooperating with the Mueller investigation maybe he’s already turned on his former associates. At this point we have no idea. We just know that Patten’s legal troubles are likely much, much worse now. Just a quick note: Ivan Katchanovksi made available a 59-minute long video appendix of his work on the Maidan sniper attacks that was presented at the 2018 Annual Meeting of the American Political Science Association. The video is filled with TV footage from that day, with a number of clips making it clear that snipers were operating from Maidan-controlled buildings. It also includes English subtitles and forensic descriptions of scenes. The footage obviously includes a number of people being shot and killed, so it’s a grizzly 59-minutes to watch, but absolutely invaluable in terms of establishing what actually happened. It is a huge irony of U.S. special counsel Robert Mueller’s inquiry into alleged collusion between U.S. President Donald J. Trump’s 2016 election campaign and the Kremlin, that the biggest fish caught to date is charged with the doing the opposite of colluding with Russia: Paul Manafort, Trump’s former campaign manager, has pled guilty to charges of (undeclared) lobbying for Ukraine in 2012-2013 to sign a political and trade association agreement with the European Union that would rescue it once and for all from the Kremlin’s grasp. There have been scores of media articles about Manafort – and 90 percent regurgitate the simplistic narrative of Manafort as a Kremlin trojan horse. This narrative was developed by Washington commercial intelligence firm Fusion GPS in 2016, as part of their now famous dossier on Trump, distributed widely among major media outlets. As a contributor to the Fusion GPS research on Manafort, I share the blame. Because we got Manafort almost completely wrong. What we got wrong about Manafort – and what Mueller has got partly right in his indictment – is that Manafort was nothing like a pro-Kremlin influence on the former Ukrainian President Viktor Yanukovych, as the dossier alleged. Instead, Manafort was one of the driving forces pushing Yanukovych towards signing the agreement with the EU. The Kremlin has every reason to hate him. An army of armchair experts pronounces on Manafort’s ‘pro-Russian’ role in Ukraine – with a copy of the Fusion GPS report close to hand. None of them ask why the supposedly “pro-Russian: Yanukovych had taken Ukraine to the verge of signing a far-reaching agreement with the EU in November 2013 – an association agreement that would see Ukraine removed from the fateful Russian orbit for good? Largely thanks to Manafort, in November 2013, Ukraine was one step away from signing the historic Association Agreement at the summit of the EU’s Eastern Partnership held in the Lithuanian capital of Vilnius. Manafort’s ally in the pro-EU push was the Ukrainian president’s chief of staff Serhiy Lovochkin. According to Yanukovych confidante Nestor Shufrich, former deputy head of Ukraine’s National Security and Defense Council, the pro-EU course had been “Lovochkin’s and Manafort’s game, it was them who foisted the idea on Yanukovych that it was achievable.” Former Poland President Aleksandr Kwasnwiewski has also confirmed that Lovochkin and Manafort together comprised the pro-EU heart of the Yanukovych administration. Manafort was amazingly successful in bringing Ukraine into the Western fold. After the jailing by Yanukovych of opposition leader and ex-Prime Minister Yulia Tymoshenko in 2011, it seemed any attempt by Ukraine to pursue closer ties with the West were dead in the water. But only two years later, Kyiv was a step away from signing the association agreement with Brussels that would create a Deep and Comprehensive Free Trade Area between EU and Ukraine. But any mention that Manafort was a driving force behind Ukraine’s move to sign up with the EU instead of with Russia – a key part of the Mueller indictment – was missing from the Fusion GPS dossier, and as a result, has been missing from most mainstream media coverage. This does not mean Manafort was a good guy: He had lots of reasons to be pro-EU, and all of them had a dollar sign. He received $42mn payments received for his pro-EU lobbying from Lyovochkin, according to his former employee Rick Gates’s testimony at the first trial in August. This was twice as much as Manafort received from all other Ukrainian sources taken together. Lyovochin denies the payments. Manafort’s relationship to Lovochkin explains why he never pushed Yanukovych to do the most obvious thing to clinch the deal with the EU – to release opposition leader Yulia Tymoshenko from jail: Lovochkin was not just a government official, but also the junior partner in business of notorious gas oligarch Dmytro Firtash. Firtash and Tymoshenko were sworn enemies. Yanukovych had jailed Tymoshenko in 2011 for having destroyed Firtash’s gas trading business during her time as prime minister. Manafort’s pitch to the EU was that EU should sign the agreement with Ukraine despite Tymoshenko’s jailing. According to Mueller’s indictment, Manafort retained a raft of EU eminence grises arguing the same, while also paying a U.S. law firm to argue that the Tymoshenko conviction was legitimate. Largely due to Manafort’s lobbying effort by November 2013, the EU had caved in, giving Ukraine the all-clear to sign the agreement in November. It was only Yanukovych’s cravenness in the face of Kremlin fury that prevented Ukraine signing in 2013. Manafort’s pro-EU role 2012-2013 accounts for his Ukrainian career continuing uninterrupted into the post-Yanukovych years – and even his helping set up a new pro-EU government in Kyiv in 2014. These activities were also omitted by the Fusion GPS dossier. Manafort’s role in the post-Maidan settlement in 2014 was a key revelation of the Gates testimony in August. The prosecution produced documents showing Manafort to have consulted both boxer-turned-politician Vitali Klitschko and chocolate king Petro Poroshenko in May 2014 as they campaigned for the respective posts of mayor of Kyiv and president of Ukraine. Both men won. (They now deny having hired Manafort for their campaigns). Manafort may have been more than mere consultant to the new powers in Kyiv. Flight records show that Manafort was in Vienna on March 25, 2014. This was the date of a crucial “kingmaker” meeting in Vienna between Lyovochkin, Firtash, Poroshenko and Klichko, where it was decided that Klichko would not run for president against Poroshenko, effectively crowning Poroshenko. Indeed far from being persona non-grata following Yanukovych’s ouster, during the post-revolution election campaigns in April and May 2014, Manafort spent a total of 27 days in Kyiv. And his last engagement in Ukraine were the regional elections of late October 2015, this time working for Lyovochkin’s new puppet opposition party. He stayed in Ukraine four weeks in the run-up to the vote – only months before signing on for Trump. The biggest unanswered question regarding Manafort is not – was he a Kremlin agent, but: just how far did Manafort and Lyovochkin go in trying to push Yanukovych back towards the EU, after he backed out of the EU agreement in late November 2013 under Kremlin pressure? What was their relationship to the pro-EU protests that broke out and the police violence in response? According to a cryptic messaging exchange between Manafort’s daughters, which was hacked in 2016, it was none other than the arch spin doctor who hatched a plan to “to send those people [protestors] out and get them slaughtered.” “Do you know whose strategy that was to cause that Revolts and what not […] As a tactic to outrage the world and get focus on Ukraine.” Manafort’s millions for Ukraine lobbying were called “blood money”. According to the daughters, for secrecy Manafort and his co-conspirators wrote the messages in the drafts of a shared email account – and Mueller has not found it. Those messages seen by Manafort’s family may confirm other high-level allegations that Lyovochkin and his team were behind the wantonly violent – and highly televised – dispersal by riot police of a small picket of pro-EU students protests on the night of November 29. The aim: to “outrage the world” and thus generate political pressure on Yanukovych to stay with the West. “Lyovochkin was the author of the dispersal of the [students’] Maidan and should be in prison, not in parliament,” Ukraine’s interior minister Arsen Avakov said on its third anniversary in 2016. But Ukrainian prosecutors have ignored the allegations, and Lyovochkin himself fiercely denies any involvement. Was Manafort’s real crime not pushing Yanukovych into the Kremlin’s embrace, but staging violence against demonstrators to achieve the opposite – a ruse that then spiraled out of control? Was this what the Manafort daughters were referring to in their texts? This is one of the secrets that Mueller has not asked about – and nor did the misguided Fusion GPS dossier. One of the Fusion GPS researchers on Manafort just published a piece in the Kyiv Post about how they completely got Manafort wrong and almost no one cares. It’s kind of amazing. It’s also work recalling that the Meduza.io profile on Konstantine Kilimnik stated that both Manafort and Kilimnik were firmly opposed to the jailing of Tymoshenko but Yanukovych went ahead with it anyway. So it sounds like Manafort was indeed advising Yanukovych against jailing Tymoshenko and just got overruled. So one of the Fusion GPS researchers who researched Manafort just published a piece in the Kyiv Post about how Fusion GPS’s dossier was almost completely wrong when it came to Manafort. And this is several months after he published a more detailed report in BNE Intellinews (a reports that’s only available on the Wayback Machine at this point). Just imagine what a blockbuster report this should be. And yet it isn’t. At all. Even the right-wing media in the US has almost entirely ignored this, which should raise big questions as to why? What’s under this rock and why is does even the right-wing media appear scared to turn it over? Is there an awareness that the situation for Trump and the broader GOP might actually become worse if the truth about Manafort became widely known? Keep in mind that, other than Trump’s quip about how maybe a 400 pound hacker sitting in bed actually did that hacks, there’s been almost no real attempt by the right-wing to make the case that maybe it wasn’t Russian hackers but instead hackers trying to leave ‘Russian hacker’ clues behind the hacks of the Democrats. There’s been a heavy promotion of the Seth Rich narrative – that there wasn’t a hack at all – and yet a near complete lack of any attempt on the right-wing to raise the possibility that there were non-Russian hackers behind the hacks. Might this reflect a concern that any serious investigation into non-Russian hackers might expose something they would rather keep hidden? And that seemingly intense refusal on all sides to even acknowledge this report from Graham Stack exists leaves us with two big questions: will this Graham Stack piece be entirely ignored or almost entirely ignored? And why is this going to be almost entirely ignored by almost all sides? It would be nice if this report was actually paid attention to because there’s all sorts of other big questions raised by it, but since it will largely be ignored the only real questions we’re left with is just how extensively will this be ignored and why. A spectacular find! Although it doesn’t state Manafort was a U.S. spook, it absolutely destroys the prevailing narrative and the author says as much! Surprise! Ukraine’s high court just ruled that the 2015 anti-corruption law required public officials to explain the sources of at least $35,000 worth of assets (or face 2 to 10 years in prison) is unconstitutional. The court determined that the law violated the presumption of innocence and shifted the burden of proof from prosecutors to defendants. And now dozens of public officials who were under investigation for corruption are going to have their cases thrown out, including a case against Ukraine’s Prosecutor General Yuriy Lutsenko. The law was requirement for continued IMF lending and visa-free travel with the EU, so it’s going to be interesting to see how the EU responds to this. By Oksana Grytsenko, Bermet Talant. Ukraine suffered a major rollback in its anti-corruption crusade when the Constitutional Court abolished criminal responsibility under an illegal enrichment law. The judges ruled on Feb. 26 that the law violated the presumption of innocence and wrongly shifted the burden of proof to defendants instead of state prosecutors. The article of the Criminal Code which the court found unconstitutional envisaged that public officials who cannot explain sources of having at least $35,000 worth of assets may face imprisonment from two to 10 years. Parliament passed the law in February 2015 as one of the anti-corruption demands of the EuroMaidan Revolution that ousted Kremlin-backed President Viktor Yanukovych on Feb. 22, 2014. The law, as part of a bigger anti-corruption drive, was also a requirement for continued International Monetary Fund lending and for the coveted visa-free travel regime with the nations of the European Union, which was introduced in 2017. After the ruling, the National Anti-Corruption Bureau of Ukraine, or NABU, said it will have to close 65 criminal probes for illegal enrichment and four more cases that have already been filed in court. They include the investigations against Infrastructure Minister Volodymyr Omelyan, Deputy Head of the Security Service of Ukraine Pavlo Demchyna, presidential candidate and leader of Radical Party Oleh Lyashko, and Prosecutor General Yuriy Lutsenko. “Now we have legalization of ill-gotten assets,” Artem Sytnyk, head of NABU said on Feb. 28. The court ruling took place five years after the EuroMaidan Revolution and one month before the presidential election on March 31. It outraged many in the country that is ranked as both one of the poorest and one of the most corrupt in Europe. Lawmaker Sergii Leshchenko, who co-sponsored the anti-corruption legislation that included the illegal enrichment clause in 2015, blamed President Petro Poroshenko for using the Constitutional Court to get immunity from criminal prosecution for himself and his cronies in case he fails to be re-elected. In its motivation part, the decision of the Grand Chamber of the Constitutional Court says that apart from violation of the presumption of innocence, the Criminal Code article on illegal enrichment also violated the norms on “legal certainty” and the right of any person not to testify against him or herself. The court’s chief judge, Stanislav Shevchuk, said that the abolished norm was in fact “obliging a defendant to collect evidence to prove his innocence,” which violates the Constitution. “It is a tough decision but it is totally justified because the fight against corruption should be real, not a pretend one,” Shevchuk wrote on Facebook. Although the decision was taken behind closed doors, insiders say that four judges out of 18 refused to support it. They include Viktor Kolisnyk, Vasyl Lemak and Serhiy Holovaty, who were appointed to the court through the president’s appointment quota, and Ihor Slidenko, appointed within parliament’s quota. This information was reported by Liga.net, which cited its own sources, and by lawyer and ex-coordinator of judiciary watchdog Public Integrity Council Vitaliy Tytych. In fact, concerns about this aspect of the now-void legislation aren’t new. Legal experts criticized this article back in 2015 when it was passed in parliament. The main legal department of the Verkhovna Rada filed a note that warned that it may violate the presumption of innocence. Nevertheless, the European experts found in June 2018 that this Criminal Court article didn’t violate Ukraine’s constitution. And the concerns of the parliament’s legal department weren’t discussed in parliament during the voting. Criminal lawyer Tytych, who represents relatives of slain EuroMaidan protesters, said the abolished article was “not ideal.” But he said its efficiency could have been checked by the Anti-Corruption Court that is expected to start its work this summer. But now, even if parliament swiftly passes a new law on illegal enrichment as Poroshenko has offered, corrupt officials will manage to avoid responsibility. “Now this criminal gang will manage to create formal grounds to legalize their assets,” Tytych said. On Feb. 28, Poroshenko filed a draft bill to replace the unlawful enrichment article that the Constitutional Court struck down. But Poroshenko’s bill appeared to be no less controversial. It changes the definition of unlawful enrichment drastically. In the previous version, an official would be punished if he “didn’t have proof of legitimate acquisition of significant assets.” In Poroshenko’s version, unlawful enrichment is defined as “illegal acquisition of significant assets” that doesn’t have signs of abuse of office or bribery. Such a law would make it impossible to punish anyone for illicit enrichment, according to experts at the Anti-Corruption Action Center watchdog. They pointed out that to prosecute any official for unlawful enrichment under this law a prosecutor would have to prove the defendant didn’t take bribes. The president’s bill has not been discussed in the parliament yet. The cancelation of the unlawful enrichment clause in the Criminal Code ruins many of the ongoing corruption investigations. De facto, it is an amnesty: even when it is replaced with a new law, it will be impossible to prosecute anyone for illegally enriching themselves in the past several years. Over nearly four years that the law on unlawful enrichment was enforced, the NABU opened 106 criminal investigations into alleged unlawful enrichment by lawmakers, judges, prosecutors, and current and former public officials. In four cases, anti-corruption prosecutors sent indictments to court. No one has been convicted yet. NABU said that it would have to close 65 ongoing investigations into a total sum of Hr 1.5 billion ($55.6 million). It also won’t be able to reopen those cases in the future. NABU called the decision politically motivated and “a step back in the fight against corruption” in a statement from Feb. 27. “We are talking about the vested interests of lawmakers who realize that they might not have a chance to stay in the parliament after the parliamentary election in the fall and want to protect themselves,” said Daria Kaleniuk, head of the Anti-Corruption Action Center. One of those who benefit from the amnesty of illegal gains is a lawmaker with the People’s Front Party, Yevhen Deidei. He was among 59 lawmakers who filed an appeal to the Constitutional Court and he had been previously investigated by NABU. In 2016, detectives found that Deydey and his wife had bought a flat and two cars whose value exceeded the couple’s declared income by four times. NABU claimed that it had sufficient evidence to have Deidei stripped of his parliamentary immunity. NABU also investigated Radical Party leader and presidential candidate Lyashko, who doesn’t own any business yet could afford a 550-square-meter house in Kozyn, an elite town outside of Kyiv; a 0.6-hectare land plot; and two cars for a total sum of Hr 20 million ($744,000). Kaleniuk says that now NABU won’t investigate how another lawmaker and presidential candidate, Yulia Tymoshenko, could afford lobbyists in the United States, whom she denied hiring but whose services she used anyway. Not only members of the parliament are now off the hook. So are judges, prosecutors, and government officials whom NABU has probed for living beyond their officially declared means and sources of income. In 2017, NABU investigated the head of the Kyiv District Administrative Court, Pavlo Vovk, who lived in an elite mansion that officially belonged to his ex-wife and therefore wasn’t mentioned in his electronic declaration. He also maintained a collection of expensive watches and traveled abroad 33 times between 2012 and 2015 on charter flights — more than his judge salary could afford. NABU prosecutors had a notice of suspicion of unlawful enrichment for deputy head of the State Security Service, Pavlo Demchyna, who in 2015–2016 spent Hr 6.4 million ($238,000) on cars, land plots, and an apartment while having an accumulated family income of Hr 2.8 million ($104,000). Former military prosecutor Kostyantyn Kulyk was indicted for illegal enrichment after NABU detectives found in 2016 that his expenditures, mostly on restaurants, shopping, and petrol, exceeded his income by two times. Head of the State Audit Service Lidiya Havrylova was accused of buying property for nearly Hr 10 million ($370,800) in 2015–2017. She couldn’t explain where this money came from, which significantly exceeded her official income. NABU determined it to be illegal enrichment and sent the materials to court. The court was also going to consider the case of Infrastructure Minister Omelyan, who had failed to prove the legality of buying BMW X5 for Hr 1.4 million as well as having $90,000 and 25,000 euros in cash. Another former government official, former head of the State Fiscal Service, Myroslav Prodan, was charged with embezzlement after anti-corruption detectives found he bought luxury cars and real estate in Kyiv and Turkey for Hr 89 million ($3.2 million). Under the now-void law, unlawful enrichment was a felony that entailed up to 10 years in prison and forfeiture of property. The Specialized Anti-Corruption Prosecutor’s Office said that since the Constitutional Court deemed the statute on illegal enrichment unconstitutional, the evidence collected in the course of those investigations becomes inadmissible too. In the cases of Kulyk, Omelyan, and Havrylova, which are already in court, the anti-corruption prosecutors will have to review the evidence and decide whether it will be possible to prosecute them for lying on their electronic declarations, which falls under the misdemeanor category and doesn’t require a serious penalty. General Prosecutor Lutsenko, said that the Constitutional Court decision wasn’t unexpected and the annulled statute was unenforceable anyway. “Lawyers call such articles ‘dead,’ or simply impossible to enforce in practice. The norms of a poorly written law didn’t work,” he said. However, back in 2015, when Lutsenko was a lawmaker, he co-authored the anti-corruption bill that included the very article he now criticizes. Yep, Ukraine’s chief prosecutor was under investigation for corruption but now that’s all going away. It’s worth recalling that it was Lutsenko who warned Ukraine’s public back in 2016 that they were in for a big surprise regarding the investigation into the Maidan sniper attacks and the role of one of the Maidan leaders in that attack. It’s also worth recalling how the “Black Ledger” that allegedly showed the Yanukovych government’s kickback network and revealed a number of payments to Paul Manafort reportedly also included a large number of names across the Ukrainian political spectrum, not just Party of Regions members. And those investigations largely came to a halt and were passed from the National Anti-Corruption Bureau of Ukraine (NABU) to Lutsenko’s office to investigate further. So it’s unclear if this ruling would impact the black ledger investigations. But since it sounds like those investigations have largely stalled anyway it might be moot.